Whew! We just wrapped up CMA Music Festival and the Stanley Cup Playoffs. 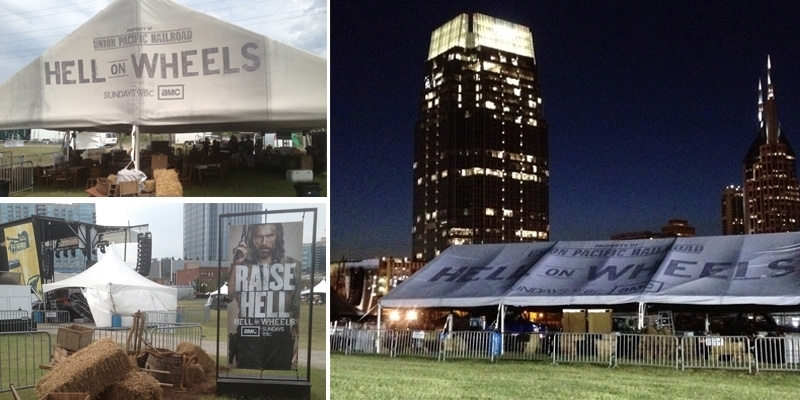 As the CMA’s and Nashville Predators’ sign partner throughout the years, we have worked long and hard to create awesome outdoor event signage for the annual music festival and sports team. It is a lot of fun to work with them both. One thing we’ve learned is that you can really get creative and go beyond a banner to advertise your brand at an event. Here’s some inspiration for doing exactly that. To promote Hell on Wheels, AMC’s western television series about the construction of the First Transcontinental Railroad across the United States, we helped create a mobile encampment. It was complete with a canvas tent, old-timey furniture, and props that brought the scene to life. Guests could feel like they were on the Oregon Trail (without the traumatizing events we remember from our days of youth playing the game, like suffering from dysentery or cholera) while they snagged some shade. Instead of creating a whole new world for guests, you can work your signage into existing architecture. 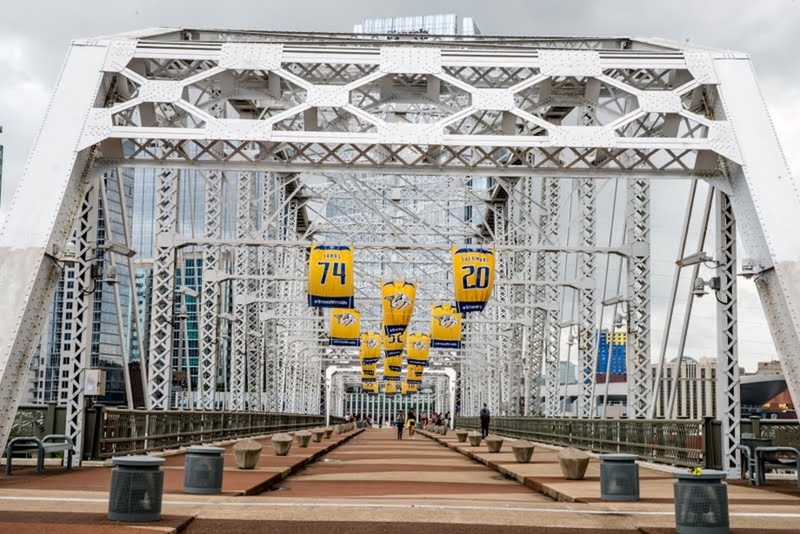 As the Nashville Predators were on a quest to hang a Stanley Cup banner from the rafters of Bridgestone Arena, we honored the team by hanging banners from the Nashville pedestrian bridge. By draping the iconic bridge with jerseys and pairing it with glorious views of the city and riverfront, we were able to create an incredible scene in Nashville. Samsung does experiential marketing perhaps better than any other company. Since we can brand pretty much anything, it was no problem to put their name on a hammock. 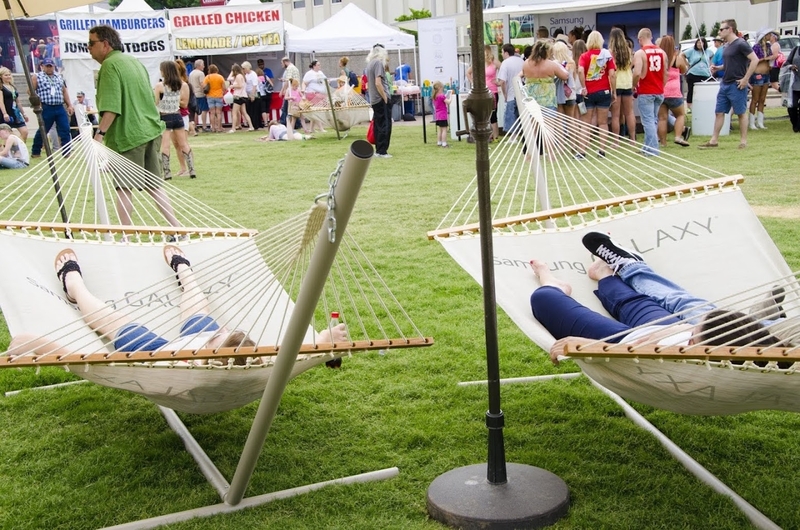 By offering festival-goers a place to rest, the brand stirred some genuine positive emotions. Delivering value to event goers, whether it’s through a device charging station, comfortable place to lounge or an unforgettable experience helps consumers further pay attention to, believe in and care about your brand. Now it’s time for you to create an awesome outdoor event branding project that will be a huge success. Get in touch with our visual identity experts to make sure every visual element is designed perfectly.